In the quiet residential area of Belair, you will find this property ready to be yours! 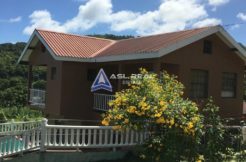 Ideally located twenty (20) minutes from capital Kingstown and ten (10) minutes from Arnos Vale, Belair is uniquely known for its cool and relaxing atmosphere and its infamous mineral spring. Its mixed geographical terrain with flat and sloping lands which allow the free flow of surface water and its amazing tropical views are a few of the key features of this village. The listed property is located on an irregular shaped parcel of land ad measuring 30,633 square feet with fertile agricultural grounds surrounded by various fruit trees. The dwelling house is a two level concrete house with 1,698 square feet of living space. There are three (3) bedrooms, two (2) bathrooms, a living room, kitchen, dining area, veranda and a storage room. This house is readily available for occupancy as all basic amenities are already available. Don’t delay! Contact us for further information and let us make this property yours today!